Is the Holiday Cheer Getting the Best of You Already? It’s not too late to add in a few tips to keep your HealthStyle on Track. 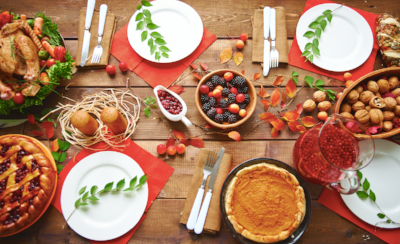 It’s hard to believe that the holiday season will be in full swing shortly, and no doubt you will be invited to your fair share of events that will tempt your resolve to eat well and not over indulge. So, if you have maintained and stayed true to your health commitments thus far this year, congratulations! But, If you are like most of us, giving in to the endless sweets, treats and dazzling alcohol libations, will be a temptation. Remember, every day is a new start! So let’s enjoy this holiday season, cheat a little, but avoid the hangover, the bloating or that “oh my…I think I feel like I have a Buddha belly!" As always, the pillars to a smart HealthStyle are: Eat real- whole food, movement, sleep, self-care. You can always bring your own: pack a few raw veggies and sneak them onto your plate. Make room for healthy fats: think avocado and nuts. Bonus: Combining fat with fiber—like dipping veggies in guacamole—has been shown to increase fat’s power to make us feel full. Avoid and say NO to sugar. As tempting as those cookies, brownies and little puffy things with frosting look, say no. But ok, not always the easiest. Start and end every event with a warm lemon water. Simply mix the juice of half a lemon into 8 oz of warm water. It can help your brain power: Lemons contain high levels of magnesium and potassium, which help your brain and nervous system function properly. Aid in weight loss: The weight loss benefits are a result of better digestion, detoxification and an increased production of bile, which breaks down food and fats better. As an added benefit, scientists say that lemons help reduce cravings. Beware of the bubbly….Not only will it add unnecessary calories, but it will reduce your resolve and willpower. Pick a wine vs. a martini or Cosmopolitan and just say no to eggnog! Drink one glass of water for every alcoholic drink you enjoy, this will slow you down and hydrate and flush your system at the same time. If you do find yourself waking up with that feeling of “I feel like I drank last night” start repairing right away. Get moving the next day: the best thing to help detox the body is a good healthy sweat. Get the the lymphatic system going and sweat out the toxins and lingering alcohol. Get the right fuel in you the next morning: the most effective way to boost your nutrition and maximize your good micronutrients intake is to drink a detox smoothie. Rest. Once you have rehydrated, released the toxins and refueled then give yourself a little more self -care by taking a nap! Cheers and Happy Holidays! We wish you all the best with your family, friends and great memories to start your new year.